Hunkemöller’s vision is to become a global and social brand and we are very successful in combining the traditional retail (bricks) channel with the e-commerce channel (clicks). We are truly focused on transitioning towards an Omni channel retailer combined with a social brand. Our IT team is constantly designing, developing, executing and maintaining a robust and innovative IT strategy that can keep up with the current and future developments in the IT landscape and the customer service expectations of our sheroes..
Internship IT - Data Privacy & Information Security (m/f) Apply now for the “Best internship in Retail” at Hunkemöller! In for a challenge at Hunkemöller? As of September 2019 our IT team at the headoffice in Hilversum, nearby Amsterdam (NL) is looking for a Data Privcay & Information Security intern. Are you currently studying and looking for an interesting IT internship at our expanding, international Retail brand? Then don’t be shy, apply! 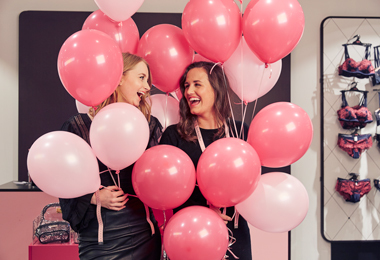 Internship IT – Support (m/f) - Solliciteer nu voor the “Best internship in Retail” bij Hunkemöller! - Klaar voor een uitdaging? Per September 2019 is ons IT team op het hoofdkantoor (HQ) in Hilversum, vlakbij Amsterdam (NL) opzoek naar een enthousiaste en leergierige stagiair. Zit jij in jouw derde of vierde jaar van jouw studie en ben jij opzoek naar een interessante IT stage bij een leuk merk? Then don’t be shy, apply! We are looking for an IT Integration Specialist (m/f) for our IT department. Our business is growing and the IT department needs to grow with it! ​Hunkemöller is looking for a (Junior) IT Support Specialist (m/f) to strengthen our IT support team - especially for 1st line support -, based at our international headquarters in Hilversum near Amsterdam. Hunkemöller is an international lingerie brand and we’re expanding rapidly with plans to grow globally over the next few years. To continuously improve the ‘World Class Service’ we offer to our customers, we’re in a constant state of ‘change and strive’ to find even more exciting ways to shop in the future. This requires an advanced IT infrastructure that supports both our store colleagues and the employees based in all our local head offices. To deliver IT “World Class Service” to our internal stakeholders, we’re searching for an additional team member to join our IT support office. Would you like to see more IT jobs?